Though I’ve never used it in an elevator, this has been my elevator pitch for content strategy since 2010 or so: “Content strategy seeks to align business goals with user expectations via sustainable online content.” It’s a single sentence that communicates the three spheres of creating content that works: you, your audience, and your content. 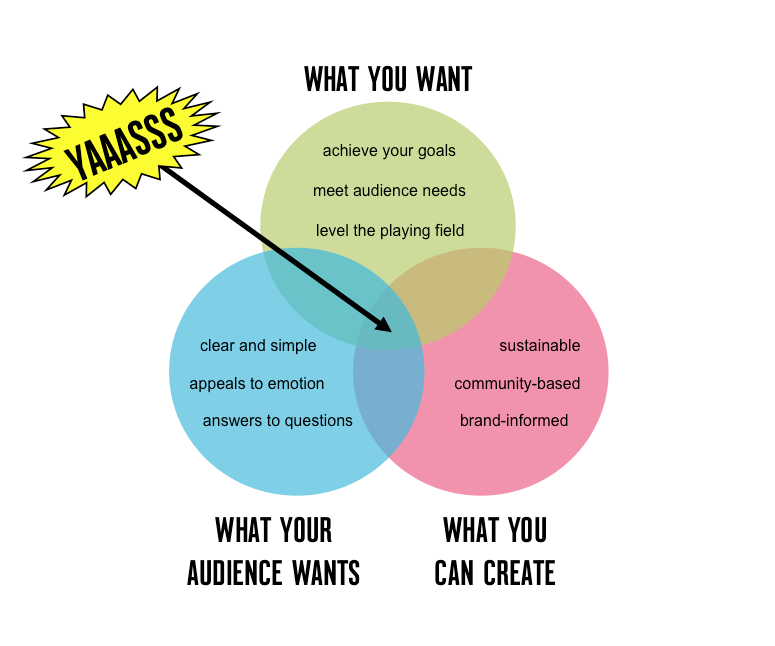 You + Audience + Content. You could make some 1,500 page PDFs available for download on your site. But, I’m pretty sure that your audience doesn’t want that. 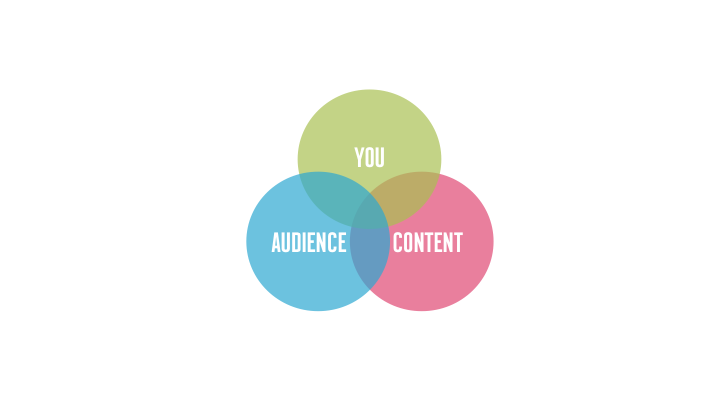 You + Audience + Content. One way to get your message across is through a full-length Hollywood feature film with this year’s Oscar winners in starring roles. Your audience might want that, but budget and resources might not allow it to happen. To avoid content calamities like these, let’s have a closer look at each of these three spheres. First, let’s talk about you. You can’t create good content without knowing who you are. I’m using “you” rather loosely to indicate the entity that needs to communicate something to an audience via digital content. It can be your employer, if you manage content on an in-house team. Or your clients, if you work as a consultant or in an agency setting. Or it can mean you, as in YOU. You can have a smart website / online presence, too. What do you do? Why do you do it? Are they local or regional or global? How do they view themselves? How do they view you? What about organizations with similar missions that don’t directly compete with you? Do they devour a share of available attention? How are you currently communicating to the world? Is your site responsive, compliant, and complete? Does it support some of the who-you-are answers from the above soul-searching exercise? Is it working? Is it appropriate? Does it put you on a level playing field with your competitors? The tree-falling-in-the-forest part of the equation comes next: your audience. Who is your audience? How do they identify themselves? Why are they your audience? Why do they align with you and your mission/service/product offering? Where are they? Local, regional, or global? How do they interact with you? Has it changed? Are they coming to you to complete a transaction, find information, or for entertainment? What mindset are they in when they come to you? Why do they seek you out as opposed to the competition? Where do they hang out, digitally speaking? Apps, mobile, social? When you know your audience and their expectations, you can then start thinking about creating content for them. Besides, what’s the point of creating content for people that aren’t interested? Or creating the wrong content for the right people? NO FUN. The final sphere: the content itself. It comes last because it’s entirely dependent upon first documenting and crystalizing definitions of yourself and your audience. FINALLY we can start asking content questions. Roles – Who does what? Responsibilities – Who owns what? Resources – What can we do? Volume – How much can we do? Approval – Who has the final say? Timing – When does it happen? With capacity in mind, think about your point of view. Tap into your identity, your reason for being, and how that might manifest itself as a message you communicate to your audience. Is this our story to tell? Are others telling this story? If so, how are we different? What do we want our content to do? What goal does it serve? Combine your capacity and your point of view to think about how your content will take shape. Lead with the message, not with the format. Is this message right for the channels they frequent? How are we telling this story – copy, visuals, video, interactives? What’s the next step? Is there a call to action? Clear – Keep it simple. Focus on a single idea. Concise – Respect the audience’s time. Say what you need in a piece, and in a channel. Compelling – Give them a reason to read or watch or listen. Provide an action for them to avoid a dead end.